Now that it's Fall it's getting colder. I've put a limit of outside fun for my kids because the weather has been crazy. One thing that we love to do around Fall and Winter is play family games while enjoying some hot cocoa and snacks. I was pretty excited when I had the opportunity to try Rubiks Race. Although it is a two person game and for players five years old and up, I had a great time playing it over the weekend with my daughter while my husband and son played Guess Who and after our game we switched. It was a pretty fun night. My kids are pretty familiar with the rubiks cube since Santa brought them one in their stockings last Christmas, so when my daughter saw that we had a game where we could race against each other, she was pretty excited. The directions are pretty simple. The game is fun and easy to get the hang of. After we played a couple of rounds, the kids played against each other and had so much fun. The object of the game? Match your tiles with the ones that's in the rubiks shaker after you've shook it. The first one to complete the pattern wins. It's super fun, competitive and very fast. Your family will get a kick out of playing this new version of the rubiks cube. This game is a must have for your family and why not get this for all to enjoy since Christmas is around the corner. The game retails for $19.99 and you can find out more information on deals and connect with Rubiks Race on Twitter and Facebook! Disclosure: All opinions are my own. 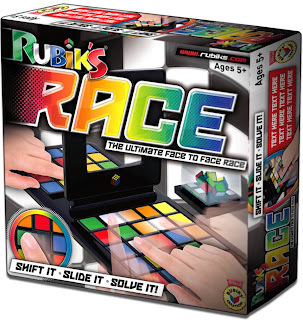 I received Rubiks Race at no cost for the purpose of this review. No other compensation was received.